Russia has a long history of space exploration milestones. In 1927, the world’s first exhibition of technology for interplanetary travel opens in Moscow; in 1957, Sputnik, the world’s first artificial satellite is launched; in 1960, two dogs, Belka and Strelka, landed onboard the prototype of the Vostok spacecraft (Korabl Sputnik-5), becoming first animals returning from orbit; one year later, Yuri Gagarin completes world’s first manned space flight onboard Vostok spacecraft; and in 1963, Valentina Tereshkova becomes the first woman in space. Tereshkova’s story is one of the most interesting in space flight history, sprinkled with internal feuds and glorious ambitious. The male-dominant Soviet society, however, was only interesting in setting milestones (If they were the first to bake a pie in space they would have been happy with that too; like the United States, don’t get me wrong). Tereshkova was sent in space not because she made a good cosmonaut. She was sent there because she was a woman. Once the job was done, only four other female cosmonauts were sent in space. In the same five decades, NASA sent 49 women. Acknowledging women may have been underrepresented in the Russian space program, the country’s space agency announced today that six women were locked inside Moscow’s Institute of Biomedical Problems at the Russian Academy of Sciences. The hand-picked crew includes women with backgrounds in medicine or biophysics. 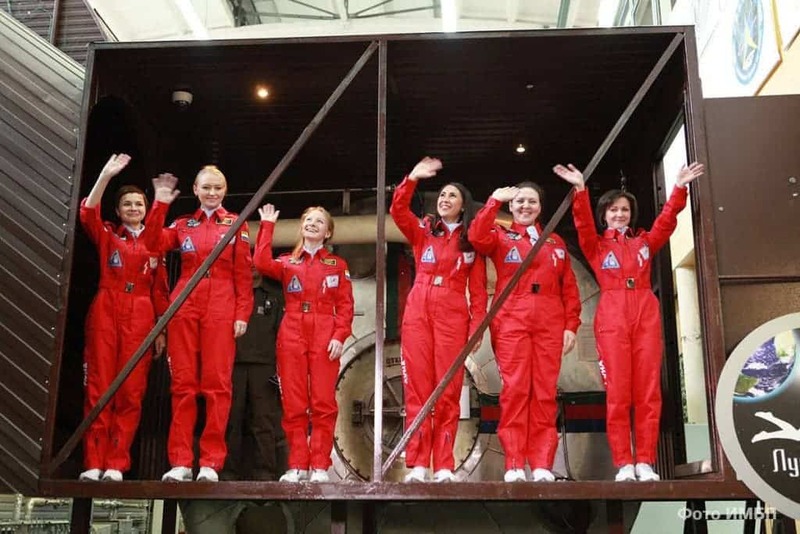 Inside, the women will simulate the conditions of a flight to the Moon and back, with the women carrying out 10 experiments covering psychology and human biology. The whole mission will take eight days. “There’s never been an all-female crew on the ISS. We consider the future of space belongs equally to men and women and unfortunately we need to catch up a bit after a period when unfortunately there haven’t been too many women in space,” said Sergei Ponomaryov, the experiment’s supervisor. According to Roscosmos, the Russian equivalent to NASA, the mission might take place in 2029 and the craft that would supposedly ferry the all-female crew to the moon is currently in construction. An un-manned test flight of the craft with take place in 2021. Previously, Roscosmos locked six male international volunteers in an isolation experiment lasting 520 days, to simulate a flight to Mars and back. It’s commendable that Russia is trying to address the gender gap in space exploration, but the way it decided to design its experiment is dubious to say the least. Why pick an all-female crew? Just because women haven’t been represented in the past five decades (that’s really a shame), why can’t you have a mixed crew? Three men and three women; one man and five women; five men and one woman. It’s really simple. Just screen applicants based on their aptitudes (technical, psychological, etc) and not on gender. Personally, I think it’s hilarious. I mean, not even the institute’s director in Moscow doesn’t take this seriously. “It will be particularly interesting in terms of psychology,” said the institute’s director Igor Ushakov. “I’d like to wish you a lack of conflicts, even though they say that in one kitchen, two housewives find it hard to live together,” he added. There have been many women who have stayed on the International Space Station for months at a time. They went along well with the rest of the crew (imagine that). As for the media, little comment is warranted. Before the women, all dressed in jumpsuits, prepared to enter lockdown journalists asked questions like how in the world would they handle the pressure, considering they’ll be locked away for eight days without makeup and men. “We are very beautiful without makeup,” parried participant Darya Komissarova. “I’m sure we all have the education, personal qualities and the upbringing, at the end of the day,” she said.